California community colleges did something counterintuitive last year, and that may put them in a strong position to rebound in 2013 with help from Proposition 30 and increased state revenues. Even as the 112-college system was getting hit with an $809 million budget cut in recent years, it was developing and slowly rolling out a comprehensive reform plan. Now, with Gov. Brown proposing to increase community college funding by $196.7 million and some financial breathing room in sight, officials see an opportunity to speed up the process. “There’s been some very significant progress; we feel that we laid some cornerstones last year that will fundamentally reshape how community colleges operate going forward,” said Erik Skinner, Executive Vice Chancellor for Programs in the California Community Colleges Chancellor’s Office. The Student Success Act of 2012 is a key piece of recasting the system. The bill by former State Sen. Alan Lowenthal – now Congressman Lowenthal – and Pasadena Senator Carol Liu, newly named chair of the Senate Education Committee, will give community college students support services when they first enroll in school. Skinner said research shows that students who go through an orientation program and develop an education plan are more likely to earn their degree or certificate or transfer to a four-year college. But colleges can’t afford to hire the thousands of additional counselors required to meet with every student whenever they’re needed, so they’re looking for answers online. The Chancellor’s Office is seeking $10 million in the new budget to develop computer programs for counseling and advising. “In terms of online technology, it’s becoming increasingly clear that this is a development that’s inevitable,” said Skinner. 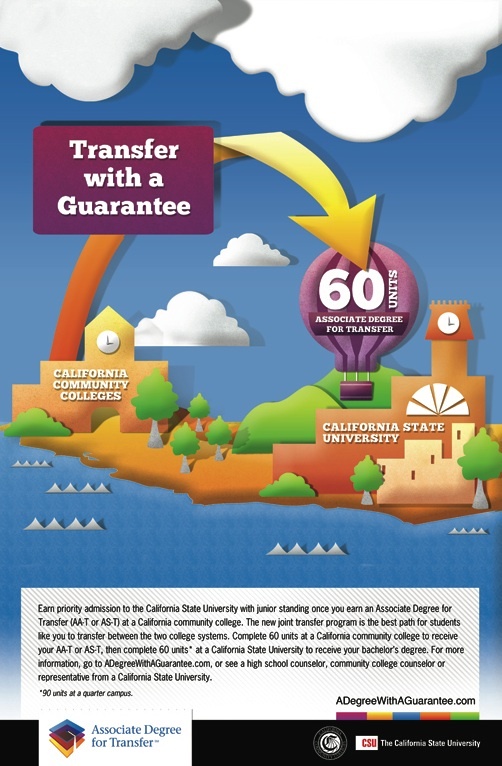 SB 1440 requires community colleges and Cal State University to agree on Associate Degrees that guarantee students placement as juniors in CSU. Source: adegreewithaguarantee.com. (click to enlarge). 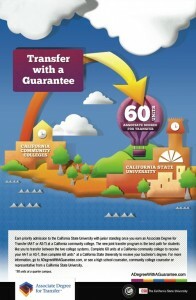 SB 1440, requires community colleges and California State University campuses to collaborate on developing transfer degrees in every major they offer and assure that community college students who successfully complete the classes for an Associate Degree in one of those majors are guaranteed admission to CSU as juniors. A Campaign study published last November found some campuses far out in front, with transfer degrees in as many as 18 different majors, while others have just a handful. A main sticking point, according to the report, is finding agreement on community college courses that are similar to required classes at CSU but aren’t quite on the mark. Siqueiros said her organization has been in talks with the bill’s author, Senator Alex Padilla (D-Pacoima), about introducing follow-up legislation that would establish benchmarks for implementation. 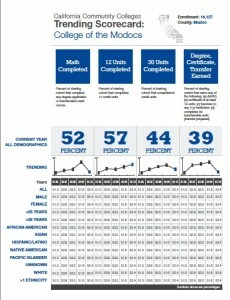 Accountability hasn’t been a strong suit of community colleges – 52 percent of students seeking a degree, certificate or transfer succeed after six years, and only 41 percent for Latino and African American students, according to the systemwide office – but officials anticipate that will start to change once the Chancellor’s Office rolls out college scorecards in March that will serve as a very public accountability measure. Sample of a community college Scorecard currently under development. Source: Community College Task Force on Student Success final report. (Click to enlarge). The scorecards will not only report graduation rates, but will disclose other indicators of a college’s achievements, such as the number of students who complete basic skills (remedial) classes, dropout rates and the percentage of students who have 30 units under their belt, the halfway point to an AA degree. And the data will be disaggregated by race and ethnicity. One obvious measure would be whether a college is facing sanctions from the accrediting agency. Three community colleges are currently on “show cause,” the most severe warning issued by the Accrediting Commission for Community and Junior Colleges (ACCJC), and could lose their accreditation. The Commission has placed another 24 campuses on probation or warning status.